Bella Goodell [resubmit] - "Artists Beware"
EDIT 2 [09/12/2017: Four years after this event, Bella has contacted me today to apologize & make up for her past mistakes as a child. She has sent me the total amount of money that I lost in the chargebacks ($105) as "friends & family" so there is no concern of a future chargeback. I consider this beware to be resolved. I have done lots of searching, but as far as I can tell, she does not have a Furaffinity [furaffinity found] or Deviantart account, or any way of identifying her other than her real name and her emails. That is why they are here. The real name is important to identify her, even though I understand that real names are not usually posted on Artist Beware. It is also important because she changes account names so frequently. I find it likely that she has more. Later half of the email removed by request, if it is needed I can add it back in. 2nd half of the emails are also blacked out in all screenshots. WHAT: Two digital character references. SUMMARY: I was commissioned for 2 character references and later found out that the customer is 13. 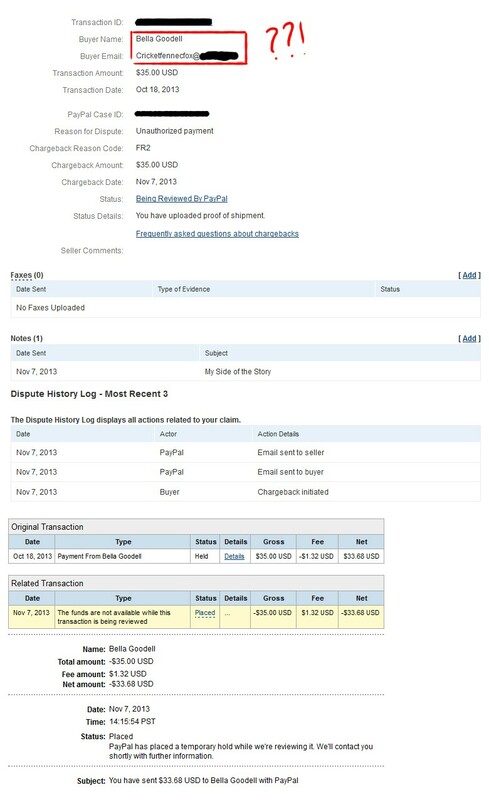 One month later, she files chargebacks despite being satisfied with the commissions. Customer also uses many email aliases, and at one point tried to commission me under a separate alias (that I now know is her, thanks to the Paypal emails). 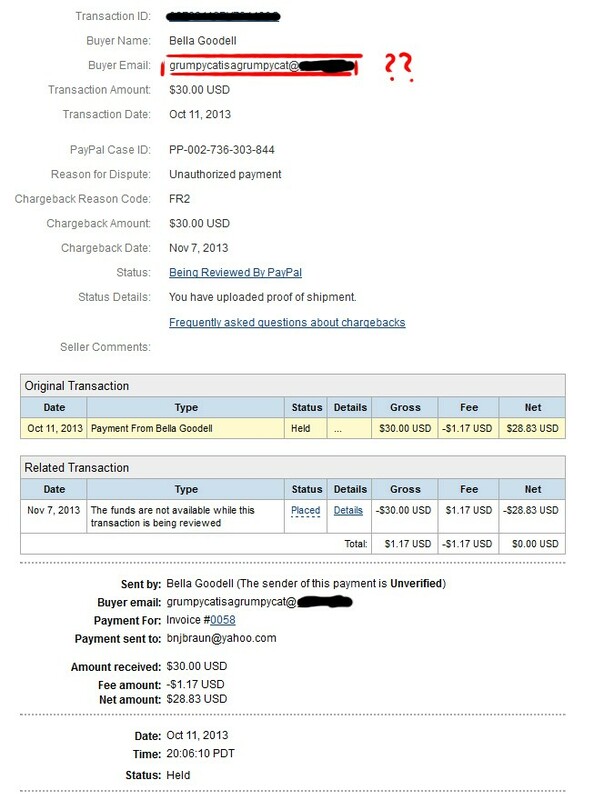 Customer is unable or unwilling to cancel the chargebacks, Paypal has given the money back to her rather than me, as well as an extra $40 fee. In all, I lost $105 on this, and I’m looking for advice as well as to warn anyone not to work with this individual. However, here’s where things start to get tricky. Halfway through working on the second reference, I find out that she is 13. I should have gone with my gut feeling and refunded her money at this point, but the commission was already halfway done, and everything had gone smoothly previously. So the commission is sent out and she is happy. But it gets weirder. The very same day I had sent out her 2nd finished character sheet, I get an email from her under one of her side-emails. At the time, I did not know it was her. She did not wind up commissioning me this time, but I feel it is important to take note of, as it shows she is sneaky and tries to get around things. I have no idea why she tried to commission me through a side email, but I will be keeping an eye out for her now, and you should too! Anyways, back to the chargebacks. I got them several weeks after finishing her commissions, with no warning or correspondence beforehand. Both of them popped up on November 7th, she had not contacted me previously. I immediately emailed her… My correspondence with her was confusing at best. I will just leave the describing to the screen caps. So basically she dances around my questions and does not really answer them, and has given me permission to auction off her characters? Do you think that is wise to do? I have lost a lot of money on this and need to make it back somehow, so I am considering it. All customers must be at least 18 years of age before sending any payments. If under 18, a parent or guardian must contact me before I can accept a commission. I also added a “Year of Birth” box on my commission form. Since adding these, I have gotten one commission from a minor and it went smoothly, I was able to get a parent to contact me and give permission. However, I do ask for some advice. What’s stopping some kid from lying about their age? Is there any way I can “scare” them into either telling the truth or not commissioning me? I asked my parents these questions and we came to the conclusion that while we can’t stop them from lying, at least we will have proof that they lied if their parents get them in trouble, contact me, or file a chargeback. But anyways yes, looking for any advice if you have it. After presenting all of my proof to paypal, paypal sided with Bella rather than me, because the references are not “tangible items”. The $30 and $35 were sent back to Bella… but for each transaction her credit card took an additional $20 as a “service fee”. I am very upset about this because I am now out $105 and there is nothing I can do. At this point I am just looking to get the word out there that Bella Goodell is not someone you should accept a commission from. There is nothing stopping her from doing this to other people. Please let me know if there are any questions or if there is any more information you would like me to fill in. I told her no, I am not comfortable with accepting money from her any more, especially since I currently have the characters up for sale. It is important to note that she now has a Furaffinity account. Beware of Corgi-Fox on FA.